KANZAN works very closely with OEMs of hardware and system manufacturer and are approved for the varied applications. The product range of ~ 100 different paper grades ensures that you will always find the right paper for your application. Self-adhesive labels, e.g. for fruit and vegetable scales in the supermarket industrial labels, e.g. bar code systems, automated labeling, baggage tags at airports. Entrance tickets, Parking Tickets, Horse race etc. Flight tickets and boarding pass. More and more lottery companies are offering on-line lotto, where the customer gets a receipt for the lotto coupon on thermal paper. Drivers obtain their parking-permission tickets from solar-energy driven ticketing machines. The stamps are pre-printed, but the face value is printed thermally according to individual requirements. 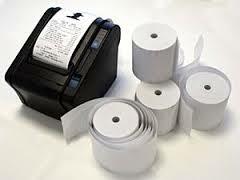 Banks use this fast-printing technology for bank statements and receipts for withdrawals or foreign exchange. The classic application, today mainly in private use for fast, uncomplicated and inexpensive printouts. KANZAN also produces quality Ink-jet papers highly specialized for high quality multi-colour printing on ink-jet printer. KANZAN is Europe's leading supplier of an extensive range of thermal papers, inkjet papers and other special products. Kanzan’ s quality and competence is characterized by our formidable technological innovative energy. Control, replicability and consistency throughout the entire production process are the guarantee for our high level of product quality, a level which sets the standards in our markets. Technical know-how and a deep understanding of customers' needs are the foundations for our high-quality and intensive customer service.